Sister Arousiag Sajonian serves as superior of Our Lady of Armenia Convent in Gyumri, Armenia. Her first name means “Carrier of Light” in Armenian. And for more than two decades, Sister Arousiag Sajonian has been bringing light and hope to a troubled corner of Armenia — a land ravaged by earthquakes, wars and economic crises. She was born and raised in the Middle East — “between Syria and Lebanon,” as she puts it — and entered the convent at age 19. A sister of the Immaculate Conception, she now serves as superior of Our Lady of Armenia Convent in Gyumri. CNEWA once described her order as a group of “no nonsense nuns” — and they are, to put it mildly, active. Sister Arousiag supervises an orphanage, a daycare center for the elderly, a vocational school and a summer camp program. We have taught some 1,000 students on a weekly basis, preparing them for Baptism, Confirmation, Eucharist and Reconciliation. We have also visited the elderly and the sick and have organized public seminars. All these activities have been made possible through a vehicle donated by CNEWA, which has carried us back and forth from village to village. Our classes and presentations were the first formal catechetical lessons offered to Armenian Catholics since the country was annexed by Soviet Russia in 1922. Sister Arousiag: Every time I haven’t been able to get enough funds for a project, I’d write a letter to CNEWA and put on the top “S.O.S.” And I always received a positive response. Immediately. ONE: What is the one message you’d like the world to hear about the work that you do? Sister Arousiag: My message would be to share what they have with the least fortunate. Most of the time, they are people who don’t know how to get out of their situations. What we want is to teach them how to overcome — how they can have a more dignified life. That is very important: that we don’t pity them. We just help them to live a better life. That is something every human being strives for. They want dignity. Want to Own the Pope's Car — and Help CNEWA? In the Spring 2016 edition of ONE, photojournalist Molly Corso profiled a World War II survivor now spending her days at a Tbilisi facility for the elderly. Here, she introduces us to some others at the facility. I was raised in a close-knit Italian family, where the median age skewed closer to 60 than 16, so walking into Caritas Georgia’s Harmony Center always feels a bit like going home. Women like Ivlita Kuchaidze, with her quick wit and self-deprecating humor, remind me of my grandma and her sisters. But there, really, the comparison ends. My grandma and her sisters, after years of hard work, enjoyed a quiet and secure retirement. Ivlita, and the 35 other senior citizens who spend their days at the Harmony Center, have not been so lucky. Whole generations of Georgians were robbed of the peaceful old age they had planned when the savings they worked for their entire lives evaporated, along with the Soviet Union, 25 years ago. Now, in their 80s and 90s, they lack the means to heat the rooms they live in and to purchase the medication they need. Instead, they depend on a mixture of charity and their small government pensions (about $66 a month) to survive. They dress in the clothes that are donated to Caritas Harmony Center, eat the meals provided at Caritas’ soup kitchen, depend on the warm showers and free medication they can receive at the day center. In a word, their lives are difficult — a far cry from the old age they planned when they were working as doctors, architects, scientists, nurses, and cultural attaches. An example: Azmat, a 90-year-old regular at the center, rides the bus to the center, using her cane to navigate the broken pavement. A former chemist and inventor, she helped create clothing and shoe factories and traveled extensively during her career at a ministry in the former Soviet Union. Now, she applies her inventor’s mind to survive the challenges of poverty: when she found she needed a cane — expensive at $12 — she redesigned a plastic broom handle to make a walking stick. Or Ivlita, a former surgical nurse, who lost the little government assistance she used to receive because she was given an electric heater. She lives, with her daughter, in a single room without any heat. To stay warm, she said, she dresses like a “cabbage”: layers and layers of clothing, even in bed. But instead of complaining about their fate, Azmat, Ivlita and the other guests at Caritas Harmony Center seem determined to get the most out of every afternoon. On holidays, they play the piano, read their own poetry and dance. On slow days, they gossip over their tea and cookies, comparing strategies for dealing with the complicated bureaucracy that doles out the little assistance they receive from the government. They devour magazines and solve crossword puzzles in the library, play chess in the sitting room. To pass the hours, they share stories from their past — and trade advice on how to stay warm after the center closes for the day. A favorite tip is to drink one’s tea while still bundled up in coat and hat, so all that captured warmth stays with them for a little bit longer. Read more about Georgia’s elderly in A Survivor Speaks in ONE magazine. In the brief video below, Molly Corso narrates a look at life at the Harmony Center. Children talk among the rubble in the city of Daraa, Syria, on 29 March. Father Haddad collects medicine from a storage unit outside his parish church in Zakho. The moment the Rev. Yousif Jamel Haddad, 31, picked me up to take me to the church he leads, I knew I was up for something special. This energetic, witty and well-rounded man greeted me wholeheartedly before we hastily drove to Zakho, a bustling small town in Kurdistan close to the majestic mountains separating this part of Iraq from Turkey and Syria. “The further north you go in Iraq, the harsher people become,” he warned — echoing, probably, the bitterness of his own experience as a pastor in this lost land. He was raised as a city boy in the capital Baghdad. Father Haddad generously shared everything with me, from personal stories about how he has become a priest to bold theological views as well as sound geopolitical analysis regarding the future of Iraq. On the road, we drove past a big mall, dozens of housing projects — some completed, but the majority still under construction — and an imposing neo-classical building, adorned with columns and a dome. That turned out to be the campus of an American university, not yet inaugurated. Everything I saw was evidence of the growing wealth of Kurdistan (growth now significantly put on hold since ISIS took over nearby territories) even if the signs of another reality, rural and destitute, can still be felt while passing through the bare landscape. In Zakho, my first stop was the Virgin Mary Church, the Syriac Catholic establishment dating back to 1612, as Father Haddad proudly noted. The evening of my arrival, the pastor was celebrating a liturgy in this newly renovated church. He himself had overseen the restoration of the building and the display of some of its treasures, like a series of ancient stones with biblical inscriptions. That was one of his first missions when he arrived almost four years ago to preside over a small community of Christians here. Father Haddad confided that he was first appointed as a bishop in the United States, but said that he could not adapt to the American way of life. After a year in Boston and other parts of the country, he decided, against all odds and resistance from his superiors, to move back to his beloved Iraq. For four days, Father Haddad, the mastermind behind the mobile clinic that I was reporting on, invited me many times for meals and tea to meet with displaced Christians from his community and discuss practical matters pertaining to refugee life as well as historical information on the Christian presence in the region. I was touched to see that he shared the rectory with displaced families. He seemed happy to see the place buzzing with the voices of children playing. He told me that when the refugees first arrived, he had to accommodate the men inside the Church and the women and children in a hall annexed to it. This situation lasted for several days before families could be relocated to rented apartments. After a year and a half of displacement, Father Haddad understood that what his community really needs is not just assistance with food and medicine but hope for the future. He said that the church is offering computer courses to help the displaced find work. He has also helped families open a bakery and other small businesses to start generating income. Among all the problems facing refugees that I witnessed here, unemployment seemed the most pressing one. I repeatedly saw looks of discomfort and shame in the eyes of the men I interviewed when they revealed they had not been working for months. The last thing that the two companions of Father Haddad, Wissam and Youssef, told me before dropping me at my hotel in Erbil was: “You know, we are educated people. We all have college degrees.” One had studied tourism and the other, drama. They had good jobs in the Nineveh Plain before ISIS occupied their homes. One worked with the local government and the other had a thriving business. But now, as they bitterly said, they were doing nothing of value. Read more about Father Haddad’s mobile clinic in Health on Wheels in the Spring 2016 edition of ONE. Meantime, check out the video below, which gives an intimate look at a day in the life of the clinic. A priest displays his cross tattoo, which Copts receive at baptism. 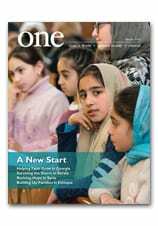 See more pictures from Egypt, and read about the faith of Christians there, in the Spring 2016 edition of ONE. Syrian refugees are seen at Fiumicino Airport in Rome on 29 February. The United Nations is urging countries around the world to accept nearly half a million Syrian refugees. Starting February 2012, we realized the new status quo was likely to persist and we had to deal with this new reality, assisting the thousands of families living in temporary shelters in the relatively safe areas of the city. Our first priority was to take care of the hundreds of children who transformed the streets into their only playground and school, putting them at the mercy of the snipers, the shelling and the street violence. I still remember one of the children hiding behind a wall and calling me to take cover from a sniper. The children of Homs became experts in the art of escaping violence, but unfortunately many were not as lucky as I was on that day, and they paid with their lives on the streets. Recent events have deeply affected the children, and we have noticed changes through our follow-ups at school. When they play, they transform wooden boxes into imitation weapons and play war games, reflecting the reality that the children are also internalizing the patterns of the war around them. Confronting this, we had to work hard to redirect the children to regular games, such as football and other sports. Most children live in a state of denial. They refuse to acknowledge their fears. Meanwhile, mothers report their children cannot sleep alone in a separate bed anymore, which speaks to their trauma. Some others report cases that required the assistance of a speech therapist and a psychologist to overcome communication troubles. At the same time, many youth have lost their jobs and their income, their great potential going to waste. Thus, we decided to join both priorities in one project, aiming to take the children out of the streets and to provide jobs to the displaced youth. As a priest, I would like to say our role as a church is to push people toward hope, which should never be abandoned — no matter how unbearable circumstances may seem. Hope is what CNEWA has helped us provide. I believe it has been a lifeline from God — helping us and guiding our efforts to glorify the name of the Lord. Read more in his Letter from Syria: Saving the Children of War from the Summer 2013 edition of ONE.